I started this vest for Afghans for Afghans months ago but set it aside to work on some other things. Finally dug it out of the pile and finished it 2 nights ago. The yarn is wool, but it's all left over from previous projects and I no longer have the manufacturer's info. I think the color scheme would work for either a boy or a girl. That electric blue really pops against the gray and dark green. Now I just have to get it to the post office before the latest campaign deadline. I'm tempted to pay someone else to go stand in that line for me. I'm happy to knit, but going to the post office is an ordeal and a half. nice vest! you're cranking out so many projects. have you tried the APC (Automated Postal Center)? it's located within the post office. it's a machine where you can mail packages and NOT stand in the long lines. Unfortunately, they don't have an APC at my neighborhood post office. They don't even have stamp machines that work. Blech. That is such a cute vest!! Thanks, Monica! 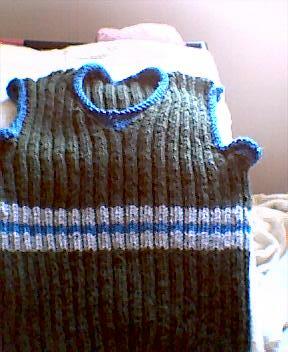 I used the generic vest pattern in Ann Budd's book, except that I knit it in the round. I hate sewing seams.